This section can be accessed from the top menu under 'Account>Manage Users'. It allows you as the Account Administrator User to control (enable/disable) rights to the users account. This will prevent specific users from changing your security settings without asking permission, protecting the confidentiality of your client’s documents. The first step in administering an account is to select the account on the left window. If you have only one account to administer you will see only that one account in the drop down window. If you have administrative rights to multiple accounts, you will see the multiple accounts listed. You administer only one account at a time. Once you select an account, you should see the cases you administer within the account on the main table of the screen. This listing shows the cases associated with the account. One or more cases can be selected for an action with the check boxes to the left of each case. An option on the left entitled 'Show Columns: Show Cases' allows you to see the total users associated or not with each case as well. To add an existing or recent users to any case, first select the user(s) you wish to assign and then choose the existing case from the drop down list on the left. Then select the case to add using the selection box to the left entitled: 'Add Case: Add Existing Case to Selected'. When adding an existing case to selected user, the main table to the right will refresh and the new user associations will be reflected. Until you do this the 'Add Case' button will be grayed out. 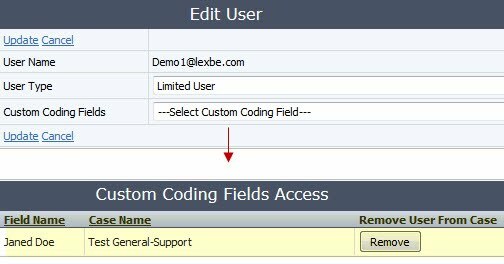 Please note that if a user already has access to Lexbe eDiscovery Platform under the email address you add from another account, then the cases you add the user to will show up on the users dashboard and he or she will have access, but an email will not be sent. If the user has lost or forgotten their login password, he/she should go through the 'recover password' procedure, for more details click here.Then a new password will be emailed to the user (Note: the old password will no longer work). If access problems persist, please contact customer support or submit a ticket here. To remove a user's access from a case or cases, first you select the user or users marking the check boxes on the main table (with the users name column shown). Then select the case to remove using the selection box to the left entitled: 'Remove Case: Remove Case from Selected Account'. Whenever you create a new user, you must also assign at least one case to his/her account. New Users. To add a new user to an account, select 'Create New user in Account', then click 'Add New User' from the left menu and you will be presented with a dialog box to allow you enter the new user email address, customize the email subject, add a personal message, and indicate whether you would like to receive a copy. After you are done, the main table to the right will reflect the new user and an introductory email will be sent to him/her along with lo-gin information and the user password. 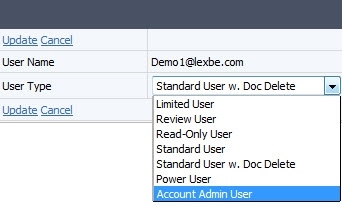 Please note that if a user already has access to Lexbe eDiscovery Platform under the email address you add from another account, then the cases you add the user to will show up on the users dashboard and he or she will have access, but an email will not be sent. If the user has lost or forgotten their login password, he/she should go through the 'recover password procedure. Then a new password will be emailed to the user (Note: the old password will no longer work). If access problems persist, please contact customer support or submit a ticket here. •Limited User. When logging in the limited user can only see certain documents from the Browse page that were assigned to his/her access by a Custom Coding Field>SharedCheckbox Field. This action is made under the Management>Manage Custom Coding section. This type of user can download documents one at a time from the Document Viewer. For more details please click here. •Review User. A new Review User type is intended for document reviewers and provides a limited view of review coding fields. Review users can only see the Browse and Document Viewer pages. •Read-Only User. This user only has the ability to read the uploaded documents from the cases assign to his/her account. Note with this approach this type of user can search and see all notes (except private), timeline, coding, etc. 4-Add/remove users, or create Custom Doc fields. •Standard User plus Add and Delete Doc. This user has all the rights of the Standard User, AND can also upload or permanently delete documents. •Power User. This user can do everything an Account Admin can do except for user administration, creating and deleting Cases. This type of user has the ability to modify metadata and tag multiple files (modify multiple columns simultaneously) by generating custom Excel spreadsheets, which can be helpful to your co-counsels that need to access Lexbe to review and code documents. NOTE: To ensure that your privacy and the confidentiality of your client’s information are protected, Standard users cannot edit metadata and will have to be updated to Power Users. •Account Admin User. An Account Admin user has full control over an account and persons should be made Admin only if that is desired. In addition to Standard User w. Doc Delete rights, an Account Admin can add more administrators and other users to cases or the account, can remove administrators and other users from cases or the account, can access usage logs, and can access all cases and data in the account. WARNING: ONLY PERSONS OF HIGH TRUST SHOULD BE ADDED AS ACCOUNT ADMINS. -Date/Time, Author, Recipients and Subject. If you classify a new or existing user under the 'Limited User' type, you also can grant this type of user access to either all or shared documents. >First you have to create a custom field and tag to identify documents and associate with the Limited Users you have established for your case. 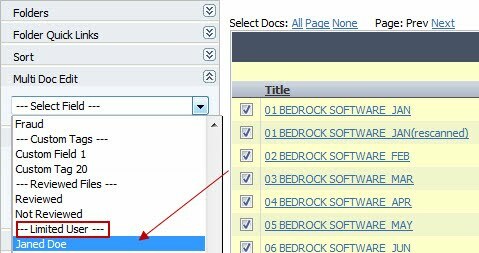 For example, if you want to share documents to be reviewed by some experts, under Manage Custom Coding menu create a section title called 'Demo Case 1' and coding fields (SharedCheckbox title) named after the experts (e.g. Expert Jone, Expert Betty, etc,). To see and work with these custom fields within a document, open a document from the Browse or Search pages. Then click to the ‘Disc tab’. The custom Sections you set up will be visible and you can click the down arrow next to a section to expand it to see the contents. >Once you have created a custom field and tag for Limited Users type, go either to the Browser or Search pages to tag documents that you want limited user have access to. >The final step is to go to the Account>Manage Users>Edit hyperlink and associate the Limited User to the specific documents tagged for that purpose. When logging in the limited user can only see certain fields created specifically for his/her access. As the main administrator, you can remove permanently from the account any user that no longer has access to any cases. To remove a user's access from a case or cases, first make sure: 'Show Columns>Show Users' is checked, select the user or users by checking the 'User Name' on the main table and finally click on 'Remove Users From Account'. After you remove user, it will display a dialog box with the message: ‘Completely Remove User From Account? The user will no longer have access to any cases in this account and will no longer be able to lo-gin to this account’. Click 'OK' and the main table will refresh and the user removal action will be reflected. When you click on the hyperlink 'Create New Case' from the Manage Users page, this action will take you to the 'Management>Account> Manage Cases' page, so that you can add a new case, and user accesses as needed. You will need to add access to yourself if you wish to see the case on your dashboard and want to be able to access it.